When I looked and saw that my last post was two weeks ago I had to go check my date book to find out what I have been doing for the last two weeks and why I have been too busy to blog. It has been a busy time and I have had a houseguest and a few major events, so I guess it's time to catch you up a bit. My houseguest was a lady from Scotland - Vivien - who came as a volunteer to teach English. Because we had a conference running at the OM facilities, there was no room for her there, so I enjoyed having her stay at my apartment for these last three weeks. 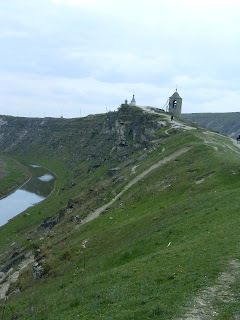 Near the beginning of her stay we went on an outing with the Dommerholt family to Orhei Vechi, a place where there is beautiful natural landscape, and a monastery complex that includes caves cut into the cliff face. We went into one, where there was an old monk, a tiny chapel, and a simple sleeping place hewn out of the rock - quite something to experience! That same week we were running a football (soccer to Canadians) conference in our new building. As we still have no gas, electricity or water, we had to bring the meals back and forth from the OM base and so there was a lot of coming and going that week. I also had the privilege of driving some of the guys to the field where they were playing. On Sunday last, I went with one of my colleagues, Ianosh, to visit one of our student teams who were out on outreach in the village of Leuseni. We had a beautiful day for the 1 1/2 hour drive and enjoyed our time with the team there. One of the team members is an English guy who is taking the 10-week course adn so it was good to touch base with him. In the sea of Moldovan language, I think he was glad to be able to speak English for a little while anyway. He shared his testimony in the worship service and guess who translated for him? That's right - yours truly. translating from English into Mo ldovan is a much bigger challenge than the other way around. Praise God that He gives us strength in all things. 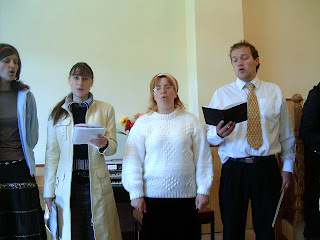 This pic shows members of the team singing for the church and Trevor (England) is on the right. 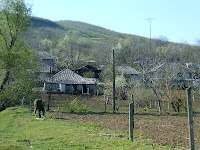 It was a beautiful little village and I also enjoyed the scenery. Posted by Barb at 12:07 a.m.